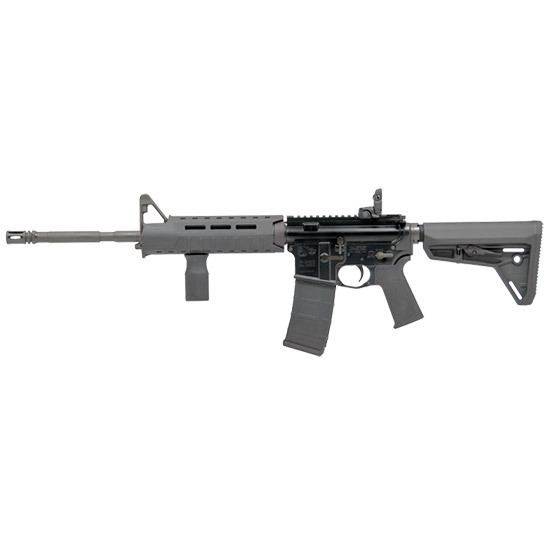 Colt Mfg LE6920MPS-B LE6920 MPS Carbine Semi-Automatic 223 Remington|5.56 NATO 16.1 FH 30+1 Magpul MOE SL Black Stk Black in. Colts LE6920MPS shares many features of its combatproven brother the Colt M4. The heart of this carbine is its 16.1 chromelined barrel. With a 17" twist ammunition selection is virtually unlimited. Colt teamed up with Magpul Industries to outfit this carbine with the most highly soughtafter accessories. The Magpul MOE SL buttstock handguard and pistol grip feature a narrow Slim Line design with an antisnag dualside release latch on the buttstock. The handguard has slots at the two six and ten oclock positions for mounting directattach MLOK accessories. The grip features an aggressive TSP texture. The LE6920MPS also has a Magpul MOE trigger guard MLOK vertical grip a Magpul Gen 2 FlipUp Rear Sight and a 30 round magazine. This model has a black furinture finish."